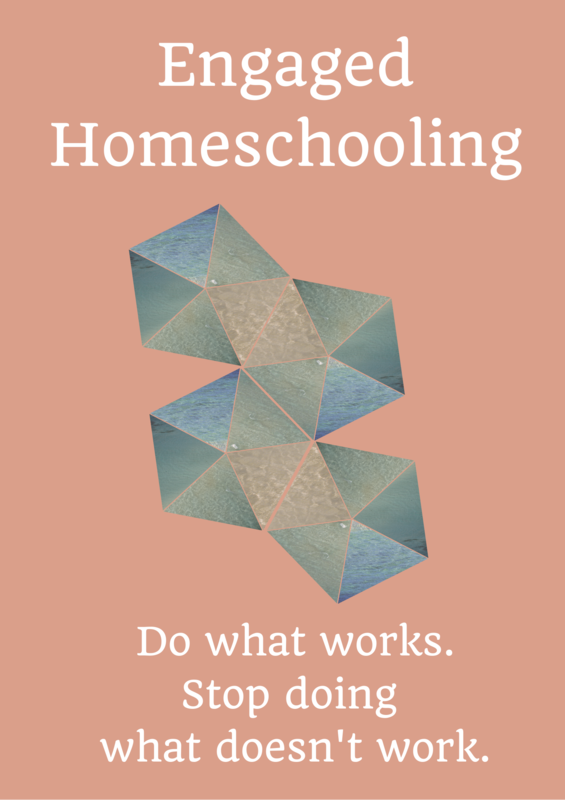 Engaged Homeschooling | Do what works. Stop doing what doesn't work. The answer? Whatever engages your child. Think that’s a bogus answer? The truth is, no matter how long we’ve been homeschooling, experienced homeschoolers can’t tell a new homeschooler which curriculum to use, or even which approach to homeschooling to use (and some homeschooling approaches do not even use curriculum per say). That’s because we don’t know which curriculum or approach will engage your child. We can make recommendations. You can read reviews. Your curriculum selection will be a process of trial and error. You need to be willing to change it if it doesn’t work. Having spent money on something is no excuse for continuing to use it when it doesn’t work. Sell it or give it away. It might work for someone else. See my two rules for engaging kids through homeschooling. Preschoolers should not be required to do early formal academic lessons from a curriculum. They need opportunities to play and do engaging things with people who are important to them. They need you to read to them and take walks with them. They need to make art, use their imaginations, learn to wonder, use their bodies, go places, and do things. Ditch any curriculum or approach for a young child that doesn’t have you snuggling on the couch together with books, playing outside, building stuff, and looking at the moon. 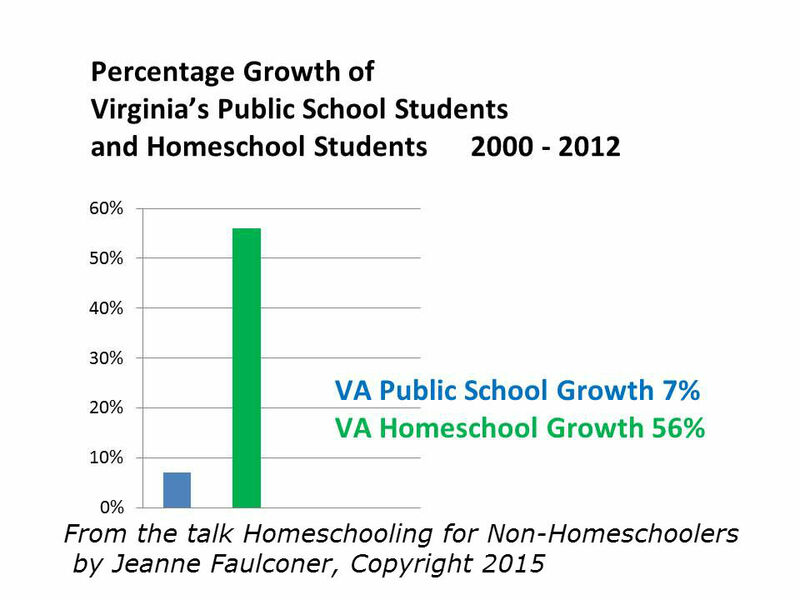 More important than curriculum selection for most new homeschoolers* is the process of deschooling — getting used to a non-school normal. 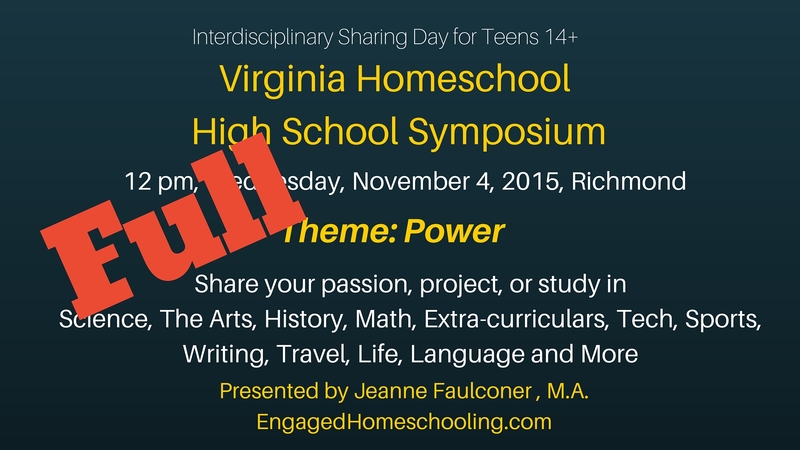 Read the Engaged Homeschooling links to deschooling to get started. If you haven’t given attention to deschooling, but you’re picking out curriculum, you’re more likely to make a curriculum choice that will not work. And hey, if your child has never been to school, this still applies to you — there’s a five-part series on Parental Deschooling listed there, because parents need to deschool in order to homeschool well. *Some new homeschoolers do have to prioritize picking out curriculum. This includes people who may be homeschooling their son or daughter for a year of high school when there is a strong chance that child may return to high school the next year. That’s because high schools in most states get to decide on placement and credits for work done at home. This also includes people who may be homeschooling a high school age athlete who wants to play a sport in college. That’s because they will need to adhere to NCAA guidelines regarding curriculum. Your homeschooling approach trumps your curriculum selection. Meaning, your general philosophy about how you want to approach homeschooling is ultimately more important to your child and ultimately a big factor in any curriculum you will choose. Will you use a projects-based approach? A school-at-home approach? A Charlotte Mason or Montessori or Waldorf-based approach? A unit studies approach? An unschooling approach? An eclectic approach? A Classical approach? A co-op approach? An online approach? If you don’t know what these things are, your homework is to read about each of these approaches to homeschooling. Engagement is the most important factor. If your curriculum doesn’t engage your child, it is a waste of time. It doesn’t matter whether the math is spiral- or mastery-based. It doesn’t matter whether the reading is phonics- or whole word-based. It doesn’t matter whether the curriculum is Christian or secular. If your child isn’t engaged, the curriculum will not assist in creating genuine learning. All this curriculum stuff is somewhat akin to how a kid will get a great toy as a birthday gift that a parent is so glad to have found and managed to afford — but then the child spends more time playing with the really cool box it came in. That happens with homeschooling. You buy a well-respected curriculum you are excited about and sure of (“and it has everything planned out for me”) — and your kid learns more from working on a bike and reading about gears and ratios. In fact, I have a whole series over at TheHomeschoolMom on what learning resources you can use Instead of Curriculum, because I’m so excited about the power of these kinds or resources in stimulating engagement. So what’s a new homeschooler to do? You can take a shot and choose a curriculum, understanding you’ll probably make major adjustments. Please don’t make your kid miserable with homeschooling before making the changes you realize you need to make. You can still read about deschooling and try the recommended activities, and you can still use the “Instead of Curriculum” type suggestions that experienced homeschoolers will be glad to tell you about. Or, you can not choose a curriculum right away, emphasizing deschooling and “Instead of Curriculum”-type learning experiences. Then after you understand a little more about the experiences and materials that engage your child, you can hone in on an approach to homeschooling and a curriculum that reflects that approach. For some people, choosing a curriculum and then adjusting is a valuable part of the journey. Getting a curriculum that turns out not to be engaging helps you determine what will engage your child. “Starting somewhere” is getting started, after all, and that’s ok, as long as you don’t become entrenched and insistent on continuing to use a tool that doesn’t fit the job. The important thing to remember is that while it feels like curriculum choice is going to guide your homeschooling in all the right academic directions, it’s really a child’s engagement that is the critical factor in terms of how much he or she will learn. While curriculum continues to be the hot question for new homeschoolers, we do well to be mindful that while curriculum can fill the bucket, engagement will light the fire. 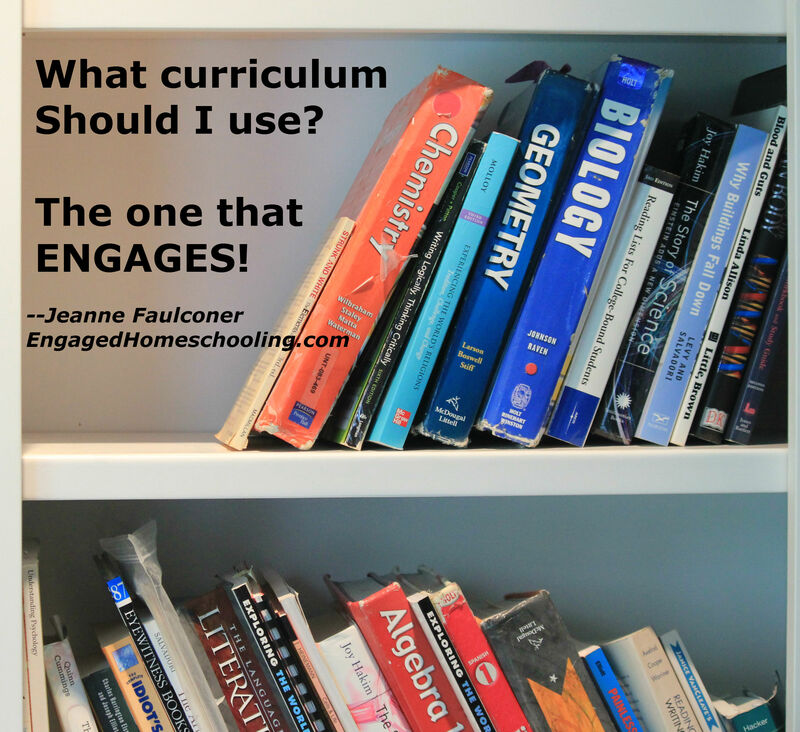 This entry was posted in Engaged learning and tagged deschooling, effective curriculum, engaging curriculum, preschool curriculum, veteran homeschoolers' advice, What curriculum should I use? on August 27, 2015 by Jeanne Faulconer. When you get off the main Highway of School, take the time to circle a while during a Deschooling period to transition to homeschooling. Then you’ll be able to decide which direction to head with your homeschooling, based on what you see in your children during that time. Original photo by Eric Carlson, adapted under Creative Commons Licensing. Deschooling is the transition time between school and homeschooling, a period of adjustment that both parents and kids have to make as they change from school norms to new family norms. 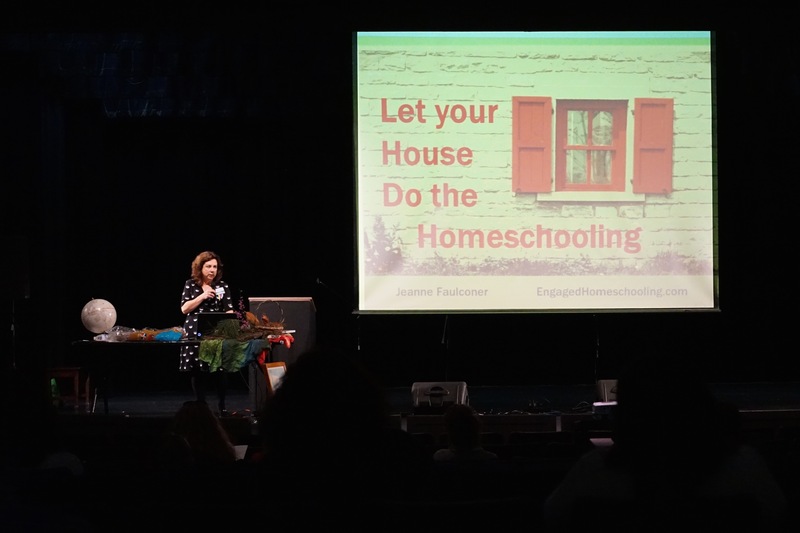 Experienced homeschoolers recommend that families who are new to homeschooling take a period of time to “de-school” before launching into home education. It’s counter-intuitive, but often children need some time to rediscover their interests, their natural rhythm of learning, their sense of curiosity, and what drives them to engage. During a deschooling period, parents can tune in to what is creating a spark in their kids, and use that information to help decide on an approach to homeschooling and what to look for in a curriculum, if they are going to use one. However, I did give them a long list of educational and family-oriented things to do together with their children — read, watch documentaries, go to museums, visit parks and natural areas, tour historical sites, get outside, get moving, create art, make stuff, re-connect with relatives and friends, meet your librarians, and network and find friends. I also told them to think of whether there is school reason or a good reason to do things with your homeschooling child — noting that there is often overlap (so don’t throw the baby out with the bathwater), but that you don’t have to do things just because those things were done in school. Instead, you can choose to do the things that work effectively for your child. That’s what results in engagement. As I promised my audience, I’m providing the links to a lot of deschooling articles I’ve written — which contain links to most of the sources I listed on the thick handout I distributed with the talk. It’s just so much easier to click through, and I know after I attend any kind of conference, I enjoy going home and reading material by the presenters and thinking through things more deliberately. These articles are over at TheHomeSchoolMom.com blog, where I’ve been given a wonderful space to reach many homeschoolers with my ideas, which frequently lead to my presentations — and vice versa. You might also enjoy my Instead of Curriculum series at TheHomeSchoolMom.com, which has a great many very specific ideas of things children learn from at home that are outside the usual idea of “curriculum.” These ideas are for fun and interesting things to do during the deschooling period — and because they are high quality, engaging activities, you’ll begin to see how learning can take place outside of an institutional environment. Or just browse all the Jeanne Faulconer homeschooling articles over at TheHomeSchoolMom.com. A lot of them fit an aspect of deschooling you may want to explore further. This entry was posted in Deschooling, Engaged learning on March 22, 2015 by Jeanne Faulconer. Read the letter from Harley Avenue Primary School in Elwood, New York, over at the Washington Post, where Valerie Strauss has provided the full text and reporting. Really, you can’t make this stuff up. Although the movement toward more rigorous learning standards has been in the national news for more than a decade, the changing face of education is beginning to feel unsettling for some people. What and how we teach is changing to meet the demands of a changing world. This is staggeringly sad, that educators must rationalize away the childhoods of children and promote the false notion that more early formal academics will somehow be of greater benefit to them than working together to create and perform a play. On the other hand, when some wonder why “regular people” are choosing to homeschool their children, just send them a link to the article. If they don’t mistake it for a satirical piece from The Onion, they’ll probably get the point. 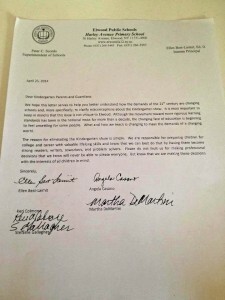 This entry was posted in Public School, School Reform on April 27, 2014 by Jeanne Faulconer.